Holkham is a large coastal parish in the north of the county. The post medieval and modern landscape has been dominated by the presence of Holkham Hall and park, which takes up most of the area of the parish. Holkham comes from the Old English meaning ‘homestead in or near a hollow’. The earliest recorded find is a Palaeolithic flint axehead and a flake (NHER 1930) found in the 1920s and 1930s. Prehistoric flint flakes, blades and scrapers (NHER 35996, 35958, 36004, 36001 and 36000) were collected during a fieldwalking survey carried out by the NAU in 2000. Two Mesolithic occupation sites (NHER 1775 and 1776) have been identified to the north of the park, close to the present coastline. Both sites are on natural mounds that were probably upstanding features during the Mesolithic, and they may have been seasonally occupied. One of the sites may have continued to be occupied during the Neolithic period (NHER 1776). There is also evidence for Bronze Age activity in the parish, and a socketed axehead (NHER 1777) and a gold torc made of twisted wire with tapering terminals (NHER 1778) have been found. The locations of several Bronze Age barrows are known within the parish. Howe Hill (NHER 1780) survives as an upstanding earthwork, and others are visible as the cropmarks of ring ditches on aerial photographs (NHER 11686, 11687 and 16579). Catte Hill (NHER 12585) and Brents Hill (NHER 21966) are two mounds shown on an estate map of 1590. The mounds are no longer visible in the landscape, but they may have been Bronze Age barrows. The earthworks of an Iron Age fort (NHER 1776) stand on a spit in Holkham Meals. The earthwork enclosure is roughly oval shaped, and a gap in the south side of the earthwork bank may be the original entrance. The Roman historian Tacitus mentions a similar fort that may be this site or the fort at Stonea in Cambridgeshire. A fragment of possible Iron Age pottery (NHER 36004) has been found during fieldwalking. No Roman sites have yet been identified in the parish, although Roman coins (NHER 1782, 1931, 16030) and fragments of pottery (NHER 1783, 1800, 11468, 35958) have been found. A possible Early Saxon cemetery (NHER 1781) was discovered in the 18th century when several inhumations were found. The exact location of the site is unknown, although it may have been associated with the Bronze Age round barrow known as Howe Hill (NHER 1780). A metal detectorist has found an Early Saxon brooch and wrist clasp (NHER 1780) close to the barrow, and a fragment of possible Early Saxon pottery (NHER 36004) has also been found. The only other Saxon find from the parish is a piece of Late Saxon or early medieval pottery (NHER 36001) found during fieldwalking. In the Domesday Book Holkham was divided between several different manors, and land was held by the King, Count Alan, William of Warenne, the Bishop of Thetford and Peter of Valognes. The largest holding was held by Tovi, and had a mill and three hundred sheep. The site of the medieval village of Holkham (NHER 1792) is now within the park, and is partly covered by the lake created in the 18th century. The village is shown on an estate map of about 1590 with the village houses clustered around a small central common and two manor houses, one of which is on the site of the present hall (NHER 1801). During the 18th century the village was gradually removed from the park, and the inhabitants were housed in new estate cottages. A second village called Staithe is shown on the 1590 map on the site of the present village of Holkham. St Withburga’s Church (NHER 1800) is some way from the site of the medieval village, and stands on a large natural mound that was once reputed to be a Saxon site. The west tower and arcades date from the 13th and 14th centuries, and the church was extensively remodelled in the 19th century. The church contains two 17th century memorials designed under the supervision of the sculptor Nicholas Stone, and an excellent example of a memorial by Boehm to Countess Juliana, who funded the restoration of the church. The countess’s mausoleum (NHER 39811) stands in the churchyard. Aerial photographs have revealed evidence of the medieval landscape of Holkham. Medieval trackways (NHER 11314 and 27843), roads (NHER 11315, 36838, 36839, 27840, 27842, 27847 and 27849) and field boundaries (NHER 36837, 36838, 27836, 27837 and 27839) survive as cropmarks and earthworks. Fragments of medieval pottery (NHER 20896, 35958 and 36016) and a coin (NHER 1784) have been found in the parish. The Ancient House (NHER 12655), now the Holkham Pottery, dates back to the 16th or 17th centuries but only a small part of the original building is now visible after an extensive 19th century restoration. Holkham Hall (NHER 1801) was built in the early 18th century to the designs of William Kent and Matthew Brettingham, and is one of the most important and influential Palladian houses in England. The house was built for Thomas Coke, later the first Earl of Leicester, and is based on purist Classical and Palladian architecture that Coke saw on the Grand Tour. The interior, partially designed by Kent, is an excellent example of restrained Classical decoration, for example the main entrance hall is based on a Roman basilica. The Hall is surrounded by one of the most important landscape parks (NHER 1802) in England. The park was laid out in the 1720s by William Kent who also designed the Obelisk (NHER 39802) and the Temple (NHER 39803). Aspects of the park's design were ‘naturalised’ by Brown in the 1760s, and Emes and Repton also worked on the park in the late 18th century. In the 19th century the formal gardens close to the Hall were laid out, and the parch marks of some formal garden layouts are visible on aerial photographs. The late 18th century walled kitchen gardens (NHER 39808) are arranged around a series of courtyards with several glasshouses and a vinery designed by Samuel Wyatt. Within the park are a number of other garden building, including a temple (NHER 39801), and an unusual example of a late 17th or 18th century thatched icehouse (NHER 12463). Palmer’s Lodge (NHER 39813) was designed by Wyatt with a large central archway linking the two small side lodges. The Triumphal Arch (NHER 39812) was completed in 1760 by Brettingham to a design by Kent. In the early 18th century a decoy pond (NHER 36031) was constructed to the north of the park. Several other buildings within the park are reminders of Holkham’s proud agricultural history. The Coke monument (NHER 39800) rises about all the other buildings in the park. The Corinthian column was erected in the mid 19th century as a memorial to Thomas Coke. The column's capital is decorated with turnips and mangle wurzels instead of acanthus leaves, and the base has reliefs depicting events such as the Holkham sheep shearings. The Great Barn (NHER 39809) was designed by Samuel Wyatt in about 1790, and is built in a very simple neo-Classical style. The barn was used to hold the famous Holkham sheep shearings that were held in the late 18th and early 19th centuries. 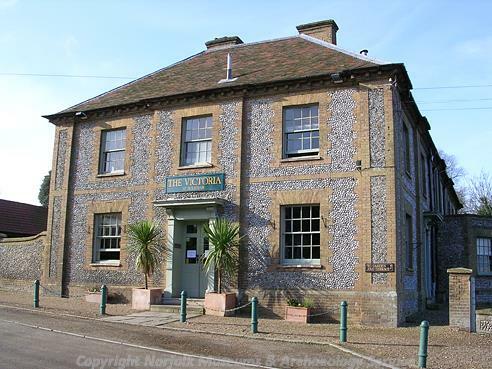 The Model Farmhouse (NHER 39806) was designed in the late 18th century by Samuel Wyatt, and may incorporate parts of the New Inn that was used by visitors to the Holkham sheep shearings. The rest of the Model Farm was designed in the mid 19th century by G.A. Dean, and was intended to be the perfect example of a modern and efficient farm. Longlands Farm (NHER 39814) is an excellent example of an 18th and 19th century estate farm, with offices, a forge, a carpenter’s workshop and an impressive clock tower. The estate includes a number of estate cottages built in the 18th and 19th centuries. They include Octagon Cottages (NHER 39805), several cottages on Park Road (NHER 39822, 39821, 43935 to 43938), and Rose Cottages (NHER 39819), a pair of late 18th century cottages designed by Wyatt as back-to-back houses. In the 19th century the dunes on Holkham Meals were planted with pine trees to stabilise the dunes and to aid the reclamation of the land between the Meals. Several post medieval sea defence banks (NHER 36036, 36033, 36841 and 1796) and other features associated with post medieval drainage schemes (NHER 36840, 1795) have been recorded in the parish. During World War Two the coastline was heavily protected in case of invasion. In Holkham there are several surviving features, and a number of others are visible on aerial photographs taken in the 1940s. Several pillboxes (NHER 36038, 36842 to 36844, 27854) were constructed, and some were surrounded with barbed wire enclosures (NHER 12654, 32418, 27855, 12656, 32421 and 27856). An Allan Williams turret (NHER 32419) and anti tank blocks and rails have been recorded on Bone’s Drove and obstructing access to the railway line (NHER 36029, 32420 and 34642). A minefield surrounded by barbed wire is visible on aerial photographs (NHER 36834) of Holkham Meals, which also show a slit trench (NHER 36845), beach scaffolding (NHER 36846) and a coastal battery with gun emplacements, searchlights and a command post (NHER 36852). Sarah Spooner (NLA), 13 April 2006.
www.holkham.co.uk. Accessed: 13 April 2006.